Sebastian | True quiet found outside. Wearing Daddy's hat. Bruno | Feeling and throwing sand in the Spring sunlight. One thing I have loved about living in Germany for nearly 6 months now, is that I've experienced enough of this life and culture to really pick up on things. My senses have been heightened since moving here—driven by a desire to soak it all up like a dry sponge. At first, despite my efforts, it was hard to find a lot of differences. In my (and Cody's) experience, growing up in southern Ohio must be a lot like growing up in Germany. Not much surprised us when we moved here, and I mean that in a really good way. Of course, there are still a plethora of differences, but it has taken a while to notice them, to sort them from the random occurrences or sporadic elements of life here. One such difference, which will come as no surprise to many, is in the way Germans dress. Oh how we American's love to hear about European style. Particularly, I want to talk about Children's clothing, not only because children's clothing is downright adorable, but because it hits on a really practical topic for parents. I do love it when I strike upon something that eases the stress of parenting, don't you? A German child's wardrobe at first struck me as being unlike an American child's, but the particulars of "why" and "how" escaped me. I embarked on a visual journey in which I tried to sort through what I saw in order to find the common threads of style. And then, after not too much strenuous observational research (I assure you I don't wile my entire life away thinking about clothes, though it is fun), I realized that the perfect word to describe a German child's wardrobe is practical. Of course, this is Germany we're talking about—order, punctuality, no-nonsense, practical. Realizing this made me love this country even more, because what should children's clothing be, if not practical? I, too, am bewitched by the siren call of unnecessary frills and useless, outrageously cute clothes, but with kids, I cannot justify it even a little bit—unless they're outrageously cute and practical. Simply put, children 1) outgrow their clothes very quickly, and 2) wear their clothes very thoroughly. A German child's wardrobe addresses these problems well. They also address the problem of keeping little ones warm and dry, which I think is paramount. Individuals and families are active here. People are simply outside more often and for longer periods of time, which necessitates having weather-appropriate clothing. Handknits. I have seen so many marvelous little girl sweaters, it's ridiculous. Leather shoes, rain boots, winter boots and house shoes. These people are serious about their shoes. Tights and Leggings—for boys, too! I love this so much, I tell you. Now that I've laid out the basics, here is how we have taken these elements and woven them into our kids wardrobe. The first principle is embrace quirky. Don't buy pre-selected sets, but look for good pieces, and mix them, or let your child mix them, in whatever way you like best. I have put some pretty crazy combos on our kids, and end up absolutely loving how fun these outfits look. It's not about perfection or matching, it's about buying interesting items, following your child's cues, and building their wardrobe in such a way that you and they can mix their wardrobe freely. The problem with most clothing sets is that they clash with basically everything else, resulting in an incredibly inflexible wardrobe that leaves no room for individual tastes. It also necessitates a larger wardrobe. My children each have 1 small drawer for their clothes, share 1 small drawer for specifically "nice" clothes, and share 1 small drawer for socks, underwear and pajamas. We do laundry twice a week, and if I'm honest, I'll admit that they actually only regularly wear 2/3 of their wardrobe. I have fairly simple tastes when it comes to kids style, so these principles work well for us (It may sound strange, but I love to see my kids when I look at them, not the clothes). But I am not suggesting these things as anything more than basic principles. Many parents—and children—will want more flair, more fancy, or more whatever, and that is great! Especially when it's what your child wants! Seb, so far, has simple tastes like me, and would wear the same solid or striped shirt with suspenders and jeans every single day. I get a lot of compliments on Seb's wardrobe, but honestly, at this point, he puts his outfits together with only a little help sometimes. Now, if you don't care at all what your kid swears, all of this is still for you, because it's about a lot more than looking nice. My reasoning is that it's good to be intentional about the way we live, and these principles and tips that I've shared have helped us simplify the process of clothing our children. We have saved money, and also allowed for Seb to have room to exercise independence and creativity by dressing himself. However, we also realize that we will receive gifts that don't fit with what we would normally buy, and we are incredibly grateful for those things, too. A principle laid out by Gretchen Rubin, and taken from Saint Therese of Lisieux, is "Receive a gift in the spirit it was given." This principle makes my heart sing, as it's been a lifelong struggle for me, and has encouraged us to live our lives with an extra amount of grace and thankfulness, because loving the people around us is more important than how we dress, or most anything else. It is often disheartening to see the way in which parents begrudge gifts, and otherwise make rules about what others can give them and their chidlren. We have been guilty of these things, and it saddens me to think of the times I've made others feel that their careful offering to our family wasn't good enough or appreciated. So here you have it—a little snippet of some ways Germany has changed us for the better, and, I hope, some food for thought for you parents who have struggled, like me, to manage your child's wardrobe. I'd love to here your thoughts and own tips! P.S. 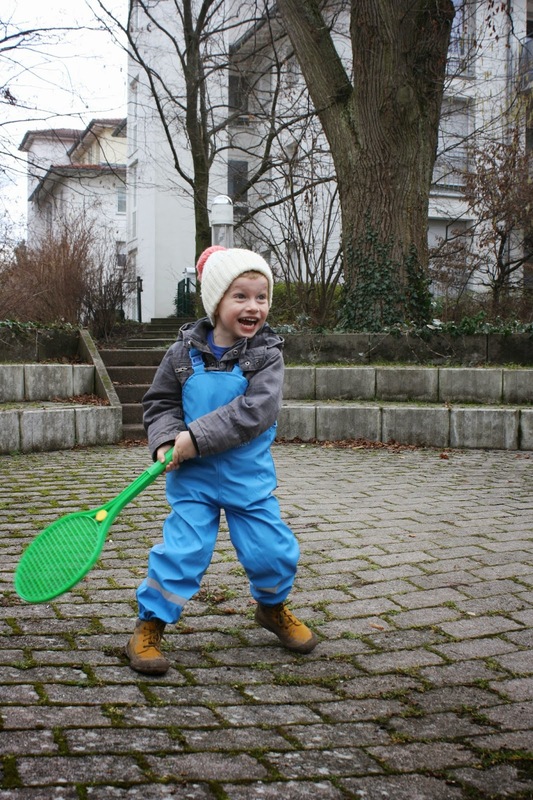 After writing this, I went on a search for photos, and realized I hardly have any photos of my kids wearing anything but Matschosen since like Chrstmas! Oops! Hurry up Spring! The photos I above are from our trip to Castle Hohenzollern a couple weeks ago. Sebastian | Always the color blue. Budding confidence, a new and deepening friendship (and a blue heart sticker warn proudly on his chest to prove it). 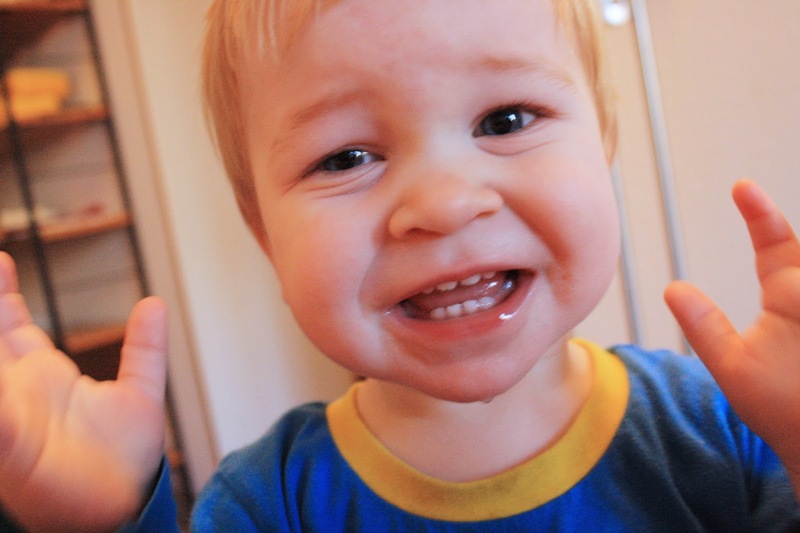 His expressions are deepening with that of the maturity of boyhood. He'll be turning 4 years old in 3 months and I am soaking up these last days that still carry a hint of the toddler years—just a hint. And at the same time am wildly excited for his mind and body to continue in this path of growth and maturity. 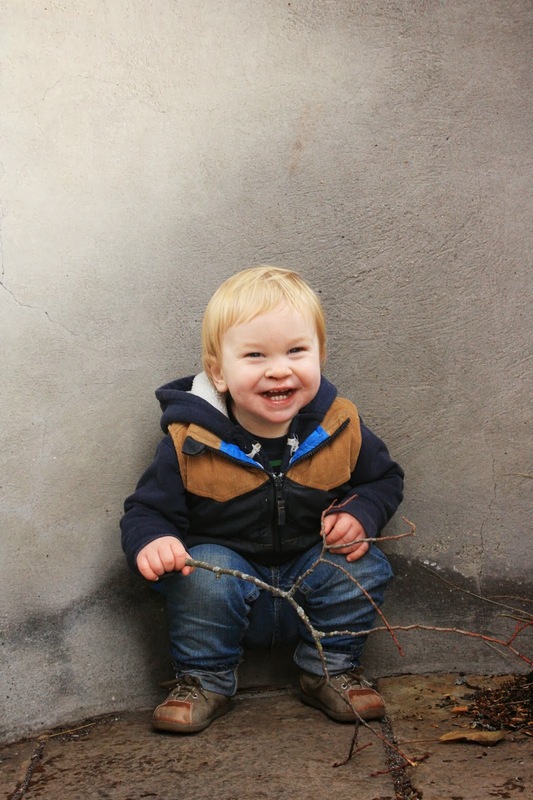 Bruno | Twenty months old this week and deep in the throes of learning and yearning. His vocabulary is blossoming, his independence is growing, and his opinions are becoming more defined. This picture captures perfectly some of the frustration of these days. Don't worry, buddy, you'll have the words you need soon! 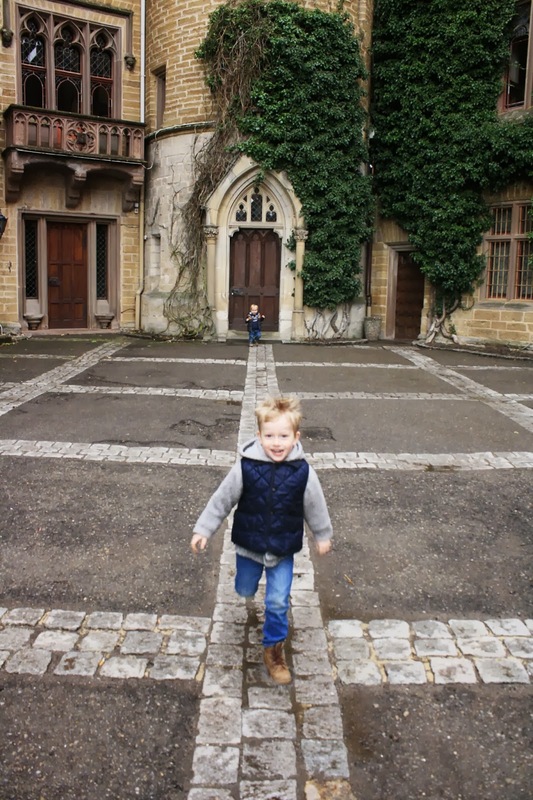 Sebastian | It's easy for me to get frustrated with Seb for doing things like plopping himself down in the middle of a castle courtyard, getting dirty, and for who knows what reason. But then he so often has a response to my, "What are you doing?" that stops me dead in my huffy tracks: "I'm fishing, mama!" His imagination is blossoming, and I don't want to squash is curiosity. Here's to letting our kids get dirty, make messes, and try knew things. So often I find myself trying to "entertain" my boys, only to realize that the best way for me to do that is to facilitate their own imaginations and desire to discover. They know how to do the rest. Bruno | He's a thrill-seeker. The park in Tübingen has an incredible slide, and while my brother and his family were visiting, we took them there. Bruno can't get enough of slides these days, and this look of pure joy is the absolute best. Last week brought more visitors, and a new hard drive for my computer. Both of which have brightened our lives. Cody just finished getting the new hard drive in, which is why 5/52 is showing up during 6/52. But I figure it's okay because it was due to technical difficulties + the portraits are from last week, so I didn't cheat or anything. 6/52 will show up in the next couple days. We have experienced an extremely mild winter. More mild even than the North Carolina winters we're accustomed to, which has been quite a shock for us. However, what we've gained in warmth has been challenged by our high latitude and dark days. Suddenly, the light and clean Scandinavian decor makes so much sense, and it's not nearly as dark here as it is there. Fortunately, we've discovered the balm of walking, playing—being outdoors. 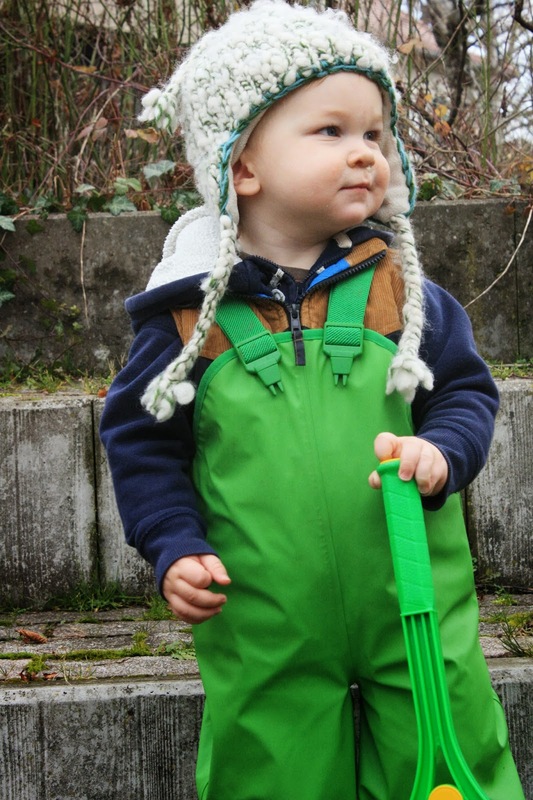 And now for the #1 secret of German parenting: Matschhosen (rain pants/mud pants). If you're interested in finding out how to get some in the U.S. I'll hook you up with some links. You'll here me talking of the sheer brilliance of Matschhosen many times over, I'm sure. Sebastian | Exuberant. Joy-filled to overflowing. My teacher. Bruno | His grin. Growing up so fast these days, and now that his verbal skills are improving, I love the addition he is to our daily conversations.